Wauseon City Council members, from left, Jeff Stiriz, Steve Schneider, and Harold Stickley listened Monday to a discussion on street repaving. 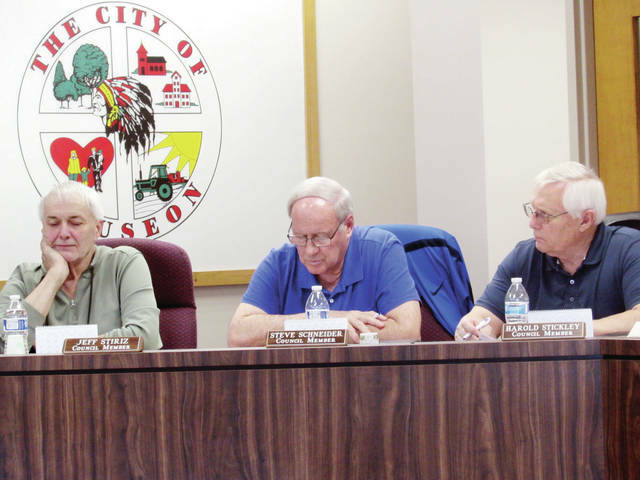 Wauseon City Council granted final authorization Monday for a joint repaving project by the city and the Ohio Department of Transportation. The council waived the rule of three readings and passed on emergency ODOT’s request to proceed with resurfacing 5.7 miles of U.S. 20A, east to west within Wauseon limits, beginning in June. The city will pay the full $406,856 cost of repaving North Shoop Avenue between U.S. 20A and the Elm Street intersection, and Elm Street from that intersection to the Clinton Street intersection. The cost will be paid through its capital and state highway funds, a permissive tax, and street revenue. The city will be assisted by federal funds allocated by the Federal Highway Administration of the U.S. Department of Transportation. One lane at a time will be paved, so two-way traffic on North Shoop Avenue will be maintained. In other business, Utility Committee chair Shane Chamberlin said no action was taken at a March 18 meeting that continued discussion of a proposed project to light the city’s Old Orchard subdivision. He said Wauseon Public Service Director Dennis Richardson reported a rough estimated cost of $53,000 to install 21 poles in the subdivision for LED lighting. Richardson informed Mayor Kathy Huner the cost of an engineer for the project, which Toledo Edison no longer provides, would be separate. Law Director Tom McWatters III briefly mentioned a public hearing held March 25 regarding a renewable five-year application filed by city residents Craig and Brenda Myers to place their farmland in a created agricultural district. The Myers bought the land from his family a year ago and wants to continue farming the city-annexed property. At the meeting, Craig Myers told City Council his main objective is protection from nuisance lawsuits. He said the land has been used to grow crops since 1980, and no livestock will be included in his plans. The land is presently designated under nonconforming use. Myers said he’s agreeable to modifications to the application, and Law Director Tom McWatters said a provision could be added stipulating that only crops can be raised. He said, however, state law can deem anything allowable in an agricultural district. Mayor Kathy Huner said creating an agricultural district for the land within city limits violates the city’s Comprehensive Plan and Zoning Code. Later in the meeting, she said it’s uncertain who might own the property in the future, so the city needs to protect itself. Questions remained whether the agricultural designation could be voided if the property later sold for development. No action on the application was taken, and the city’s Buildings and Ground Committee will review the request. City Council has 30 days to render a decision. • Fire Chief Rick Sluder said the department has installed an in-house alerting system. He said fire contracts with area townships are being finalized, and the department is working on sprinkler system installation and training as part of the county courthouse renovation. • Police Chief Keith Torbet said 37 officers from four of the county’s six law enforcement agencies participated last week in domestic violence training. He said the next Coffee With a Cop event will be April 24, 8-9 a.m., at Sullys Bakery and Bistro, 206 N. Fulton St. Torbet said the department is considering another Use of Force class, possibly in mid-May. He also reported the near completion of renovations on the department’s patrolmen’s room. • Public Service Director Dennis Richardson said a water main extension has begun for the expansion project at Haas Door. • Finance Director Jamie Giguere said the city’s March income tax revenue was down 5.7 percent from the same time last year. Huner mentioned to Council she had attended ALICE (Alert, Lockdown, Inform, Counter, and Evacuate) active shooter training at the Fulton County Emergency Management Agency building. She said the training was offered to people in decision-making positions. Council members passed on emergency a resolution authorizing the mayor to enter into a water service agreement with Fulton County.